In the 1950's, 60's and 70's, cruising was one of the most enjoyable weekend social events for American teenagers. In Denver, Colfax Avenue was The cruise. Cruising involved cool cars, local hamburger emporiums, milk shakes and music. Cruising was a good, safe event that generated many wonderful memories. As the baby boomers got busy building their families and careers, cruising faded away. The cruisers of yesteryear have reached maturity (i.e. Baby Boomers). Most of us have gray hair and get to bed much earlier than we did in the past. However, we have not lost our love of the cars and the great memories of the Saturday night cruise. We own the cars of our dreams now and have become active members of many front range car clubs. All that is missing to complete the circle is the return of the Colfax Avenue Cruise. 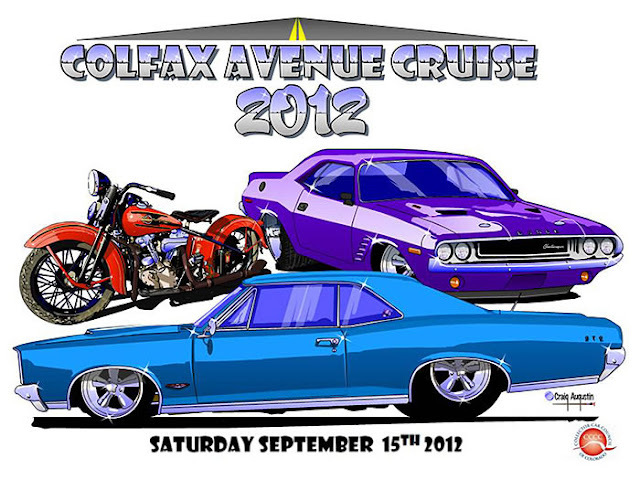 The Cruise Colfax is to be held Saturday 9/15/2012 from 4PM to 8PM The Cruise will be a dynamic event with the display cars cruising from event to event (Festival Sites) as the owners visit, show off their cars, eat dinner, and watch others cruise. There will be entertainment (50s and 60s era rock and roll bands) as well as food vendors and sponsors at each Festival Site. This type of cruise (or cruise-in) has become very popular over the past few years in the Denver area. Typically a cruise is organized by a drive inn (Sonic is a good example) who would hire a disk jockey to play 60s music from 6-9 PM and advertise within the car community. A well advertised cruise can draw 200-400 classic cars. Traffic is not a problem because the cars tend to come and go at irregular intervals. The cars attracted to a cruise are vintage or classics (original 1920s -70s), street rods (modified pre 1948) and American muscle cars (1960-1974). The presence of these classic cars always creates interest and excitement among the general public and never fails to attract a large crowd of interested spectators. This is being organized by the front range car community with the support of the Old Car Council of Colorado. The OCCC (est. 1965) is an umbrella organization composed of over fifty car clubs in Colorado with more than 3500 paid members. The purpose of the OCCC is to promote and preserve the old car hobby in Colorado through legislative activity and the coordination of car club activities. The officers and members of the OCCC have the interest and the experience to partner with organizations involved in the development of Colfax Avenue to plan and implement the Colfax Cruise. The OCCC will actively promote the Colfax Cruise, recruit Colfax Ave. businesses to work in partnership with specific car clubs and coordinate with local and state law enforcement. It is our plan to make this an annual event that will expand to include other communities along Colfax Avenue. This is the highlight of our summer! We'll be there again with the Old Goat! I read that the Cruise 2012 has been cancelled. It would be nice if it is true that it is posted on this site. Ira, the Cruise 2012 has indeed been cancelled. I just posted a update on this today. I met with a committee this morning about resuming the event next year, so I'm keeping my fingers crossed! im going anyway, its not about poker run for me just the old cars driving up and down colfax ! chambers to kipling yeah buddy !